My son went off to camp today so last night I made up some homemade bug spray. There are lots of recipes on the Internet. This one below is specifically for ticks. Geranium is safe for both kids and dogs. You can place one drop of geranium oil on your dog’s collar or shoulder blades to repel ticks (do not use the spray). See this article here for more info on Geranium oil. Combine all of the ingredients except the water in a 4 ounce spray bottle. I like to use a glass spray bottle or a dark plastic. You can get them at your local health food store or order online. I order from www.bulkapothecary.com. Shake well and let sit for about an hour before you add water to the remainder of the bottle. Leave some room at the top so you can shake it up. If you just want a tick repellent, you can just use 40 drops of geranium oil for your spray. Geranium is specifically for ticks. Some people already have a bug spray but want an extra tick repellent in addition. I decided to add cedarwood to this to make it less “girly” smelling for my son for camp, and then I added another 5 drops of citronella to make it a better mosquito repellent. Shake well before each use. Be sure to spray shoes and socks the most. Ticks are often in the grass and get on to you by climbing on to your shoes or socks first. They also often head for the neck, ears, hair area so I like to carefully spray the back of the neck too. Some oils (like coconut oil) can leave an oil stain on the clothes so I make sure to spray a mist rather than spraying close up. And always remember to check for ticks every day, especially if camping. I usually add all my ingredients into my 4 cup glass measuring cup because it has a pouring spout that makes it easier to get into the bottle. I bought my fractionated coconut oil at www.bulkapothecary.com. You can find some at health food stores as well. Since this one contains coconut oil which can stain clothes, be careful when spraying on clothes. I do a light mist on the clothes and then spray on the skin. This recipe did not say to add witch hazel but if you have some and want to add a TB or so, feel free. If you feel the smell is too strong, you can add a few drops of orange or another citrus essential oil to lighten it up a bit. Someone on the Plant Therapy board added both orange and lavender to hers and she likes it much better. I plan to do this when I get my orange essential oil in the mail. Plant Therapy currently has a “Christmas in July” sale going on all month long and I got a free Sweet Orange oil. My 4 and 8 year old love putting this bug spray on. I don’t know why! This is another synergy blend by Plant Therapy for $7.99. The only difference from the Ban the Bugs is that it uses some oils that are not safe for kids under about age 10. It includes the oils citronella, eucalyptus globulus, cedarwood, lemongrass, lavender, may chang, tea tree, patchouli, and catnip. I haven’t made this one up yet but it smells similar to Ban the Bugs but a little better. 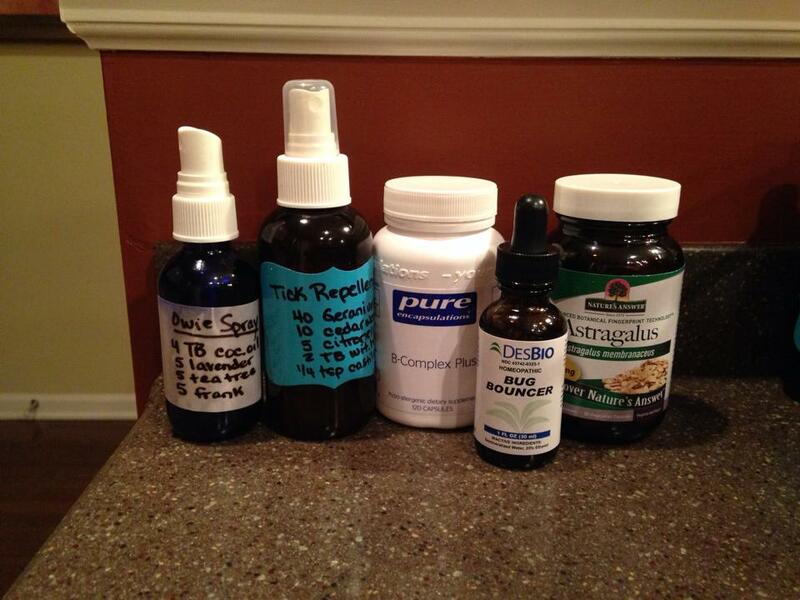 Add 2 TB of witch hazel and 20 to 50 drops of Insect Shield (I used 40) to a 4 oz spray bottle. Fill the rest of the bottle with water, leaving room at the top for shaking. Shake well before each use. Can spray directly on skin. You could use fractionated coconut oil as well but just be careful when spraying on clothes. See this blog post here for more info on Insect Shield Blend. I got this recipe from my friend Christel. I didn’t have any eucalyptus the first time I made it so I just omitted it and it still worked great. She uses it as a bug spray. I use it to kill bugs. 🙂 Some of these oils are not safe to use on young kids, and you need to be careful with all essential oils around pets as they have sensitive noses. Another reason I’m glad we don’t have pets. 🙂 Sorry dog lovers! Eucalyptus and peppermint are optional. You could omit them, making it safer for kids. Combine all of the above ingredients. Shake before each use. I use this to kill ants and keep them away! 🙂 I love it! Works great! Oil is used instead of water because water would just evaporate. If I get ants, I’ll spray this where they are coming in at and where they are congregating. It kills them on contact and keeps them away for a while. You do have to continue to spray occasionally as the scent will fade. This one has a strong smell to it though. And it will leave a slight oil residue wherever you spray it but I don’t mind. It’s better than ants! I just clean it up when the ants are all gone. When we went on vacation I left a few cotton balls soaked in this spray in the areas where we were getting ants and it kept them away while we were gone. I had my neighbor come by to check for ants after a couple of days and to respray the cotton balls. Certain types of ants I can get rid of by leaving out corn meal. They can’t digest corn so they’ll take it back to their nest and die after eating it. It takes a few days though to kill all of them off so you have to be patient. If I act quickly, all I need to use is this bug spray. We had one type of ant though that didn’t like the corn meal! Wouldn’t touch it. Maybe they were forewarned by our previous guests. And if I’m in a hurry and out of this spray, I’ve also just thrown some water or olive oil and peppermint oil into the spray bottle and that works great too though it leaves a strong smell in the house. Ants (and mice) hate peppermint! If you have mice, leave cotton balls soaked in peppermint oil and olive oil in the areas you are getting them. You will have to replace the cotton balls every week or so though. And if you have little ones in the house, you want to avoid using peppermint oil. It can disrupt the breathing of babies. If you don’t want to smell like a citronella candle but still want to be protected from bugs while outside, this one might be a better option. It only contains two essential oils. Lavender is sweet smelling and cedarwood is woodsy smelling so would be appropriate for both girls and guys. Both of these oils are kid safe and repel insects. This has a very light scent. I haven’t tried this one out yet. I would use this one when out and about but if I was going camping or hiking, I would personally opt for one of the first three recipes. Combine the above and shake well. This will fill a 2 oz spray bottle. Fill the remainder of the bottle with water or FCO (fractionated coconut oil), leaving some room at the top to shake. Combine and shake well before each use. If you don’t have witch hazel and do have vodka, you could use vodka in place of witch hazel in any of these recipes, unless you do not want to use alcohol for whatever reason. All of these recipes use non-toxic ingredients, as opposed to commercial bug sprays which contain harmful insecticides. 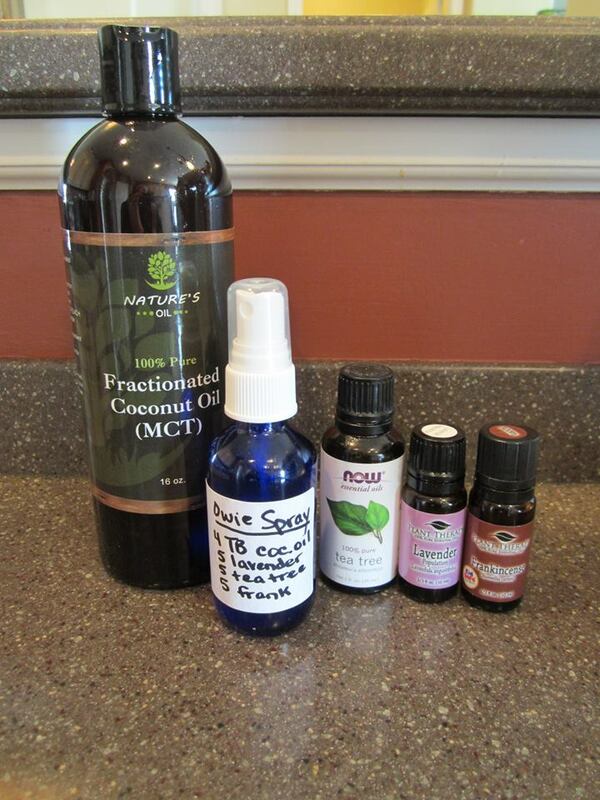 From testimonies, the DIY essential oil bug sprays work just as well and often better than commercial bug sprays. Since my son was bit by an infected tick in April, I considered using regular bug spray for camp this year but decided against it. Even the experts agree that no bug spray is full proof, including sprays with DEET. My friend sent her son to camp with DEET and he used it every day and still got a tick bite with an accompanying bulls eye rash (FYI – bulls eye rash means Lyme 100% of the time). So, I felt very comfortable sending my son with the homemade DIY bug spray #1 as I feel this one is the strongest tick repellent. All of these DIY repellents need to be reapplied about every two hours for best protection. Mosquitos are out the most around dusk. I don’t think ticks have a preference. I told my son to spray himself before going to breakfast and then again before dinner. Hopefully he remembers! I also had him taking B-complex for the last two months prior to going to camp. Taking at least 100 mg of B-1 every day for at least three weeks (this is how long it takes to really get into your body), makes you not as tasty to mosquitos. Avoiding sugar also helps. Bugs use their sense of smell to find you and are attracted to certain people more than others. This is due to the scent you are giving off due to diet and overall health. We take this B-complex by Pure Encapsulation which contains 100 mg of B-1. I got this one on Amazon here or I order it from my holistic doctor. It’s about $32. B-complex is great for symptoms of ADHD, anxiety, stress, and for better overall function of the nervous system. I give along with magnesium for better absorption. Astragalus can also be taken daily to prevent Lyme disease should you get bitten by an infected tick. My son is also taking this. 1,000 mg is the suggested dose for prevention (he takes one capsule (500mg) at breakfast and one at dinner. Astragalus boosts the immune system. My son took 3,000 mg a day for the first 60 days after he was bit by a tick and got a bulls eye rash. Taking a higher dose helps eliminate the Lyme bacteria but should only be taken for an acute (recent) infection, not for chronic Lyme. In chronic Lyme, the immune system is already over stimulated from trying to fight off Lyme so you don’t need to boost it any more. But in new cases of Lyme, you want to boost the immune system so your body can find and kill the bacteria. Astragalus also helps slow the signs of aging by lengthening telomeres. Bonus! Dr. Oz talked about astragalus on his show. See the article here. I order Astragalus by Nature’s Answer on iherb.com here. It’s pretty cheap (about $10). I get the half root powder and half root extract. You can also get it in a tincture form for kids. I just bought some but haven’t tried it yet. Astragalus is recommended for kids who live in high tick endemic areas as a prevention for Lyme. My son is also taking a homeopathic tincture called Bug Bouncer. 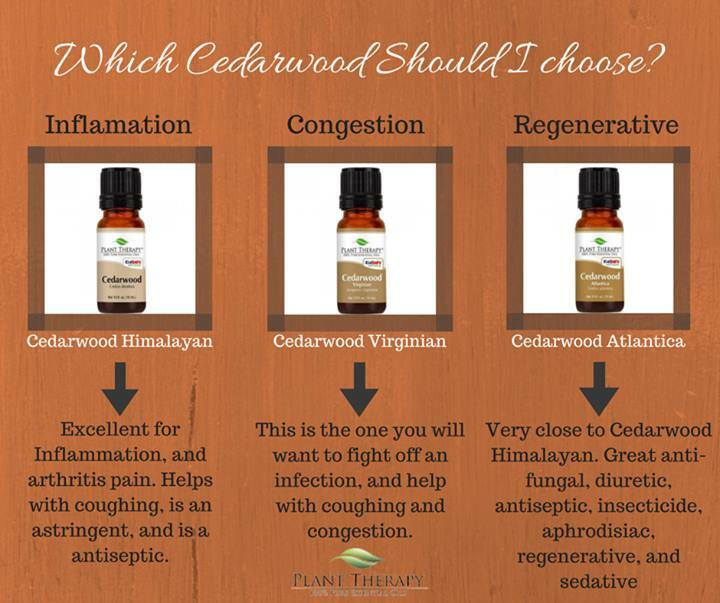 It helps treat the symptoms of Lyme and it helps repel ticks and bugs. Some people take it before going outside. It has some alcohol in it so some kids don’t like the taste. My 15 year old is OK with it, chased down with water. I get it from my (LLND) Lyme literate naturopathic doctor. And to treat bug bites, we use an “Owie” spray. This stuff works great! We use it for everything. Acne, cuts, bruises, mosquito bites, tick bites, splinters, shaving cuts, etc. I sent this with to camp as well. It was a big hit in the cabin last year. My son didn’t get bit much but his friend did, and his bites were better by the following day. 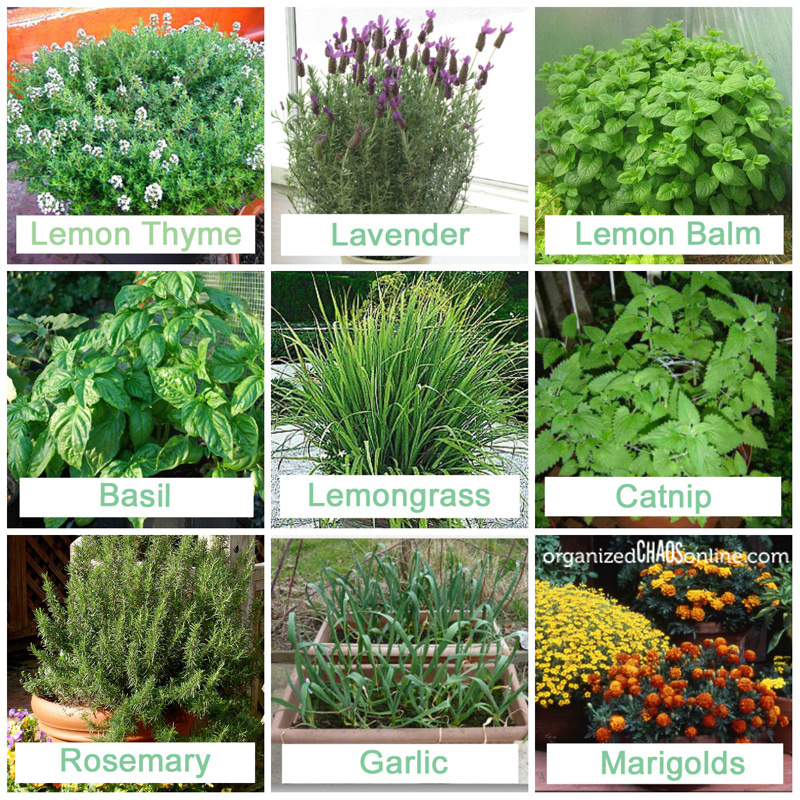 And to keep bugs at bay in your yard, consider planting some of these plants which bugs hate. I went to a tree nursery and got some citronella plants, rosemary, and lemon balm, and planted them in the back yard. I also planted geraniums in my flower pots and marigolds in my garden. And I have some basil growing in my garden. I’ve also heard you can spread diatomaceous earth in your back yard to repel bugs but I haven’t tried it. Marigolds, citronella, and rosemary. I found a bunch of grubs on this side of my garden and was grossed out so I didn’t want to plant any vegetables on this side. I think it’s safe to say, “I hate bugs!” 🙂 What’s your favorite DIY bug spray? Please share in the comments below! 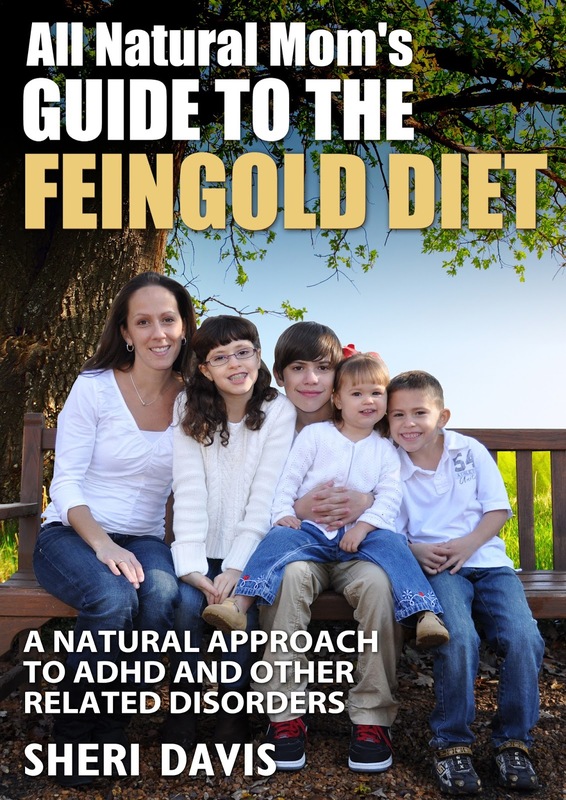 And check out my new book on Amazon, “All Natural Mom’s Guide to the Feingold Diet – A Natural Approach to ADHD and Other Related Disorders” available now starting at just $3.99 for the e-book! For dog and cat-friendly flea and tick powder recipes based on powdered herbs, diatomaceous earth, and bentonite clay…Naturally Bug-Free contains recipes for those, as well. I use those on my indoor cats and don’t have a flea problem anymore.